Museums have many curious objects behind closed doors. Recently, volunteers discovered some ‘cold ones’ at Tullie House Museum and Art Gallery Trust. If museums are icebergs, then museum exhibits are just the tip; and the remaining 90% or so of specimens are tucked away safely behind closed doors. Many people, lucky enough to have visited these museum storage areas (‘behind-the-scenes’), will be familiar with almost endless rows of racks and shelves packed with all sorts of different objects, ranging from Chinese vases to taxidermy monitor lizards. But few non-curators would be familiar with the idea of freezers full of dead animals! We have two large freezers, at our off-site storage facility, packed full of animals; we needed to know exactly how many animals were in there and where they were from, hence this project- Cold Case Curation. The specimens also have excellent provenance; labels with location details including specific grid references and dates. Therefore this Cold Case Curation project was as much a biological survey (albeit indoors) as a detailed museum inventory. Cold Case Curation in action; the team of five volunteers surveying the ‘Fauna of our Freezers’. Enter our team of volunteers. They were specially recruited for a day for this Cold Case Curation task; to survey the frozen fauna, matching specimens against existing inventory records. This was a joint initiative with our Cumbria Biodiversity Data Centre (hosted at the Museum), to capture biological records. Most of our volunteers are long-term with the Museum and the Centre, and are current university students. 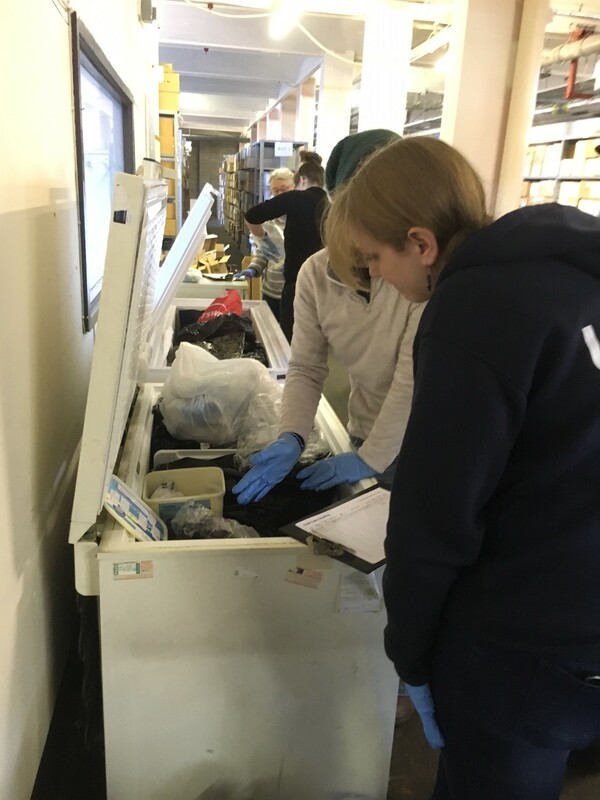 As our team of five volunteers eagerly crowded around the two huge freezers, they were fascinated with the idea of freezing animals to preserve them before they are stuffed and prepared as taxidermy specimens (but don’t worry, they all died naturally!). In teams, the volunteers enthusiastically worked their way through documenting the freezer contents. 241 individual specimens later, we had documented 11 species of mammal and 48 species of bird. Interesting discoveries included a bittern, a little grebe chick, 10 waxwings and a white-tailed tropic bird (with stomach contents). Volunteers delighted in handling iconic British species including 54 red squirrels and 24 barn owls. 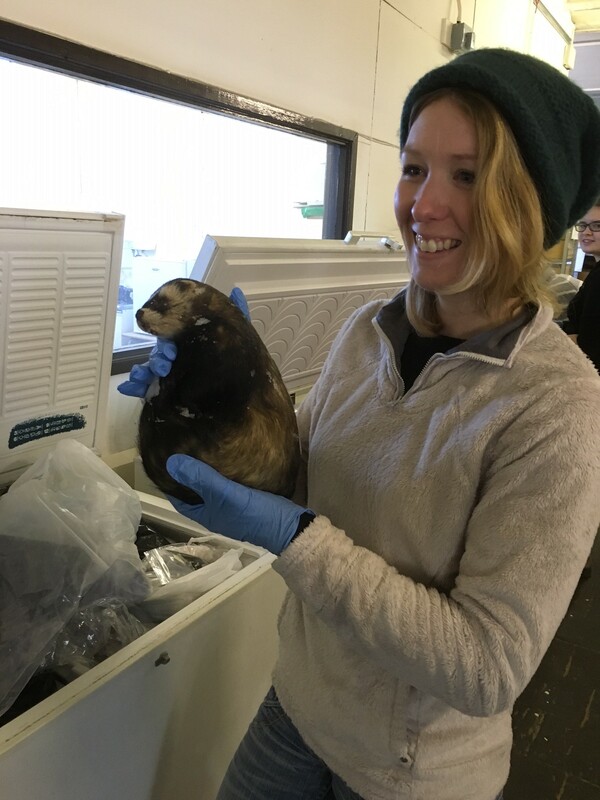 Volunteer, Jessica Mitchell proudly wielding a polecat from the freezer faunal assemblage. “After helping out at Tullie House with their cold case curation, recording everything they had in the freezers, we found some amazing specimens from polecats to owls, your typical garden birds to brown hares, but I have to say my favourite by far was the river otter. This otter was fantastic and it was brilliant to see it so upclose as it is a creature I have only seen from afar in the wild. This event was extremely educational and rewarding to myself as I’m studying zoology here in Carlisle”. Volunteer, Laura Carter. 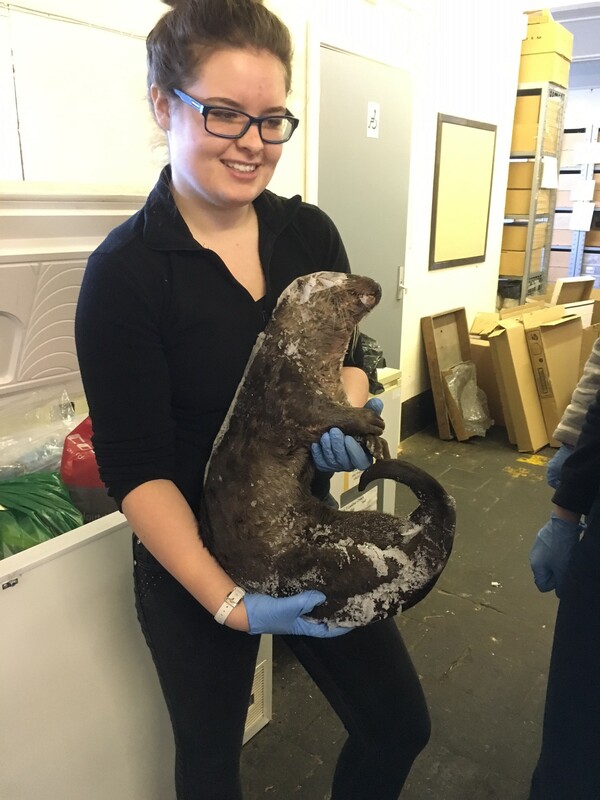 Volunteer, Laura Carter with a River Otter discovery from the freezer. The Museum has greatly benefited from this exercise with our detailed inventories and biological records which will go into our database and ultimately end up on the Global Biodiversity Network Gateway for public access (and we also have the data we need to make more informed decisions over which specimens we decide to formally accession). However, this project proved to be a particularly successful public engagement event. It was a combination of the fact that volunteers were seeing and handling a variety of animals and that they were ‘discovering specimens’, whilst working together as a team, which is vastly more enjoyable than lone working. The event was enhanced with use of Twitter (#coldcasecuration), which captured some of the magical moments of discovery. This exercise illustrates how a relatively routine (inventory) collections management exercise can be turned into an exciting public engagement project, capturing critical data for the museum and inspiring a future generation of potential young scientists and curators.